Harness the power of the stars. Rebuild the defiled Orrery and unlock the secrets of this Mages Guild Inner Sanctum. Upon installing the plug-in you receive a note alerting you that some part shipments for the Orrery have been hijacked by bandits. Travel to Camp Ales to find the first bandit, retrieve a stolen part, and find out where the other parts are located. Retrieve the other stolen parts from various campsites. Return all the stolen parts to Bothiel and let her repair the Orrery. Activate the Orrery to receive a greater power as reward. Upon loading the plug-in you will automatically receive a note from Bothiel (a mage at the Arcane University), asking you to recover some missing Dwarven artifacts that are needed to repair the Imperial Orrery. The last known location of the bandits is Camp Ales, to the far west of Cyrodiil. If you start a new game with this plug-in loaded, the note and quest will be given to you when you emerge from the sewers into the daylight at the end of the tutorial level. Travel to Camp Ales, where you will find two or more bandits. It is possible you have already been there (the location exists before the plugin is installed), in which case you can fast-travel. One of the bandits is identified as a male Redguard Bandit Carrier; he is the one that is carrying a Dwarven artifact (specifically a Dwarven Cog) as well as an undelivered letter. The letter lists four other campsites where the other artifacts are hidden. All four campsites are in the western part of Cyrodiil (in a rough circle centered on Camp Ales), and exist before the plugin is installed. You can also visit any of these campsites before going to Camp Ales, and you will find the Bandit Carrier and artifact already there. The Bandit Carriers are all equivalent to bandit ringleaders. Therefore, their level is one higher than yours. They can be wearing full suits of light armor, all pieces of which may be enchanted, and they are carrying a blunt weapon that also may be enchanted. The equipment carried by the bandits can be more valuable than the cash reward for the quest itself. Once you have all the pieces, return to the University and talk to Bothiel, who should be waiting in the Arch-Mage's Lobby (you do not need to be a member of the Mages Guild to complete the quest). Bothiel will take all the items from you, and in exchange reward you with a leveled amount of gold. The gold is 100 times your level, up to a maximum of 3000 gold (although Bothiel says "Here's your reward", there is no screen update telling you the gold was added to your inventory, so it is easy to overlook this reward). Bothiel will need a day to repair the Orrery, at which point you will get a quest update telling you the repair is complete (the repair is actually completed at midnight, so if you give the items to Bothiel at 11:59 pm, you may only have to wait a couple minutes for the repair to be done). From that point you can enter the Orrery whenever you wish. The first time you go in, you will have to activate it at the Imperial Orrery Console. Once it is active, you can use it to gain one of eight greater powers, as described in the next section. The following are the greater powers obtained from the repaired Orrery; a different one is obtained during each of the eight different phases of the moons (Masser and Secunda). The phase changes every three days. The display of the two moons shown at the console can be used to determine the current moon phase, as described in the table (the two moons always have the same phase). For each greater power, one attribute is fortified by 20 points, while another attribute is drained by 20 points; the duration is always 60 seconds. As with all greater powers, these spells cost 0 magicka, but can only be cast once per day. You can only have access to one of these greater powers at a time. However, you can later return to the Orrery to swap for a different greater power (if the current power is different than the one you already have, you will be asked whether you want to switch out the powers; if it is the same, you will be told that "You already have the Orrery's current power"). The powers are listed in the order in which they become available. Therefore, if you receive Secunda's Will on one visit, returning three days later will yield Secunda's Opportunity; waiting another three days will give Masser's Alacrity. There is no notification when you receive your reward. The door to the Orrery is present even without the plug-in installed, though it is locked. Entering it counts as trespassing and requires the console as it has no corresponding key. Without the plug-in, the room itself is no more than an unusually enlarged, empty dome. It is possible during this quest for Bothiel to disappear indefinitely into inaccessible areas. This seems to occur particularly if you are doing this quest and Necromancer's Moon at the same time. One known solution is to uninstall this plug-in; within 24 hours Bothiel should reappear in the Arch-Mage's Lobby. Complete Necromancer's Moon, then reinstall the plug-in. For some reason, all of the artifacts use the same icon as a dwarven shield. On the other hand, the items all actually look like bolts of cloth (although you will never see them in-game, since they are quest items that you can not remove from your inventory or otherwise put down). This issue has been addressed by the Unofficial Oblivion DLC Patches; it adds icons from Morrowind. The moon phases shown at the Orrery's console are, unfortunately, not the same as the actual phases of the moons visible in the night sky (when it's not a cloudy night). 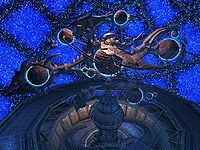 Bothiel will refer to the Orrery as being in "a state of disrepair" in the Necromancer's Moon Mages Guild quest even after it has been repaired. 10 I've discovered a note from Bothiel at the Arcane University. If I can recover the Dwarven artifacts that have gone missing, there may be a reward. I should travel to Camp Ales and see if I can track down these bandits. 20 I've found a list of locations at which the Dwarven Artifacts for the Orrery are being held. I should visit Dagny's Camp, Brotch Camp, Bodean Camp and Varus Camp to track down the remaining bandits. 30 I have recovered all of the missing Dwarven artifacts. I should take them to Bothiel at the Arcane University at once, so she can repair the Orrery. 40 Bothiel has been given the Dwarven Artifacts necessary for the Orrery. I should give her a day to make the necessary repairs, and then visit the Orrery again at the Arcane University. 100 The Orrery at the Arcane University should be functional once more. I can visit it as often as I like, and also receive powers based on the phases of the moons. 110 Finishes quest I have activated the Imperial Orrery. It is possible to use the console to advance through the quest by entering setstage DLCOrrery stage, where stage is the number of the stage you wish to complete. It is not possible to un-complete (i.e. go back) quest stages. See SetStage for more information.